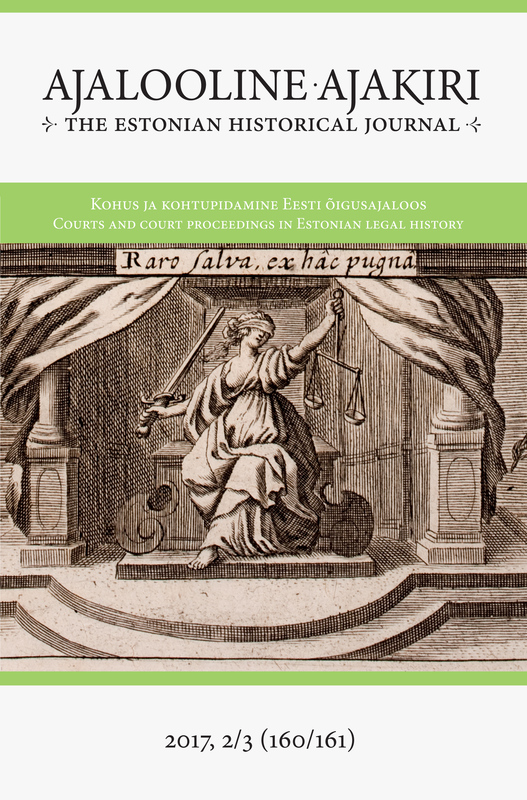 This paper analyses court cases, a hitherto little acknowledged source in Estonian history of early modern law. Specifically, we analyse six cases where a person’s status – that of a free man or of a serf – was at stake. We ask how different sources of law were used in the claims of the parties and the judgments of the courts, and which arguments and interpretations were drawn upon. The cases took place about two to three decades before the abolishment of serfdom in the province. They are of interest from the perspective of the history of early modern serfdom, modern reception of Roman law and the hierarchy of legal sources, as well as with regard to the history of the Enlightenment and human rights. The court cases illustrate how legal practice participates in discourses of its time. They shed light on the legal situation during the Regency Era, when Estland’s local system of justice was altered with the aim of harmonising the administrative system in the Russian Empire. The scarcity of such cases is explained by the fact that they affected only a small portion of the population of the province of Estland. Of the approximately 200,000 people living in the countryside, only 3.5 per cent were of free status – mainly people such as craftsmen, millers, sextons, innkeepers, and manor servants. It is not surprising that there were even fewer persons of borderline status who could go to court to claim their freedom. Peasant families of foreign origin, families descending from sextons, and a manor servant figure in the trials. The court cases were shaped by the scarcity of local law and the uncertainty of court practice under Regency. There was no provision in Estland’s written law concerning the two central questions in the trials – the expiry and the relinquishment of a person’s freedom. The most relevant stipulation was a 30-year limit, after which the affiliation of runaway peasants expired. Whether a court considered it possible to carry this limitation over to the expiry of a person’s freedom as well depended on the court’s interpretation of both local custom and the current legal situation. Local custom and earlier Russian ordinances permitted the enserfment of free persons, whereas more recent ordinances prohibited it. The question arose in the courts concerning the extent to which the more recent provisions should be implemented retroactively, and how to relate the ‘spirit of the age’ manifested in them to local custom. Moreover, if a court considered it appropriate to apply the provisions concerning Roman slaves or coloni to local serfs, it had to consider the prohibition in Roman law against enserfing free persons and negating the possibility of expiry of freedom. In fact, the judgments depended on the court’s understanding of the applicability of favor libertatis in Roman law – the principle that court judgments were to be pronounced in favour of freedom in cases where there was evidence of equal weight in favour of a person’s serfdom and freedom. Deriving from favor libertatis, the principle of praesumptio libertatis stated that what had to be proven was a person’s slave or serf status, not their freedom. Therefore, applying Roman slave law to local serfs was beneficial for claimants of freedom, whereas for landlords it was useful to state a difference between Roman slavery and local serfdom. Estate owners also claimed that in provinces like Estland, presumption of serfdom was to be applied in cases concerning peasants. The question of whether or not someone appeared like a ‘normal peasant’ hence became one of the issues discussed in court. We can see a certain consolidation of court practice over time. The courts applied Roman law in the event that they wished to take the ‘spirit of the age’ into account: when they needed to ground the position that a free man could not have been enserfed even prior to Catherine’s ordinances that prohibited enserfment. In the two earliest cases in the 1780s, the court of first instance applied Roman law almost exclusively in justifying its positions. In the three subsequent cases, living like a serf for 30 years, or having been registered among the serfs of an estate during land audits was seen either as evidence of the expiry of freedom, or as evidence of the acceptance of serf status, yet without referring to any specific legal provision. Thus, over time the courts’ emphasis shifted from applying “foreign law” towards local practice and Russian regulations. The sixth court case was exceptional in that the person in question was a manor servant rather than a peasant. In his case, the central questions were whether a soldier had the right to grant freedom to his servant, who was given to him by his parents to accompany him in war, and whether or not returning to the manor to serve as a valet entailed becoming a serf once again.